I am a quite fond of Jessica Rylan. I wanted to write a much more in depth post about her…she fascinates me that much. However, I just haven’t gotten around to it and I wanted to post this video as it’s been sitting in my drafts for quite some time. I just had to share it with you. I love my Little Boy Blue synthesizer. 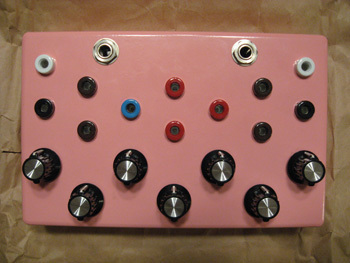 This is one of the synthesizers she manufactured at her Flower Electronics company. If you have a spare hour check this lecture out. You won’t be let down by her intellect and vision. This talk takes place at MIT on June 29, 2009. At this lecture she talks about her music, noise, some of her favorite noise artists and her theories on chaos just for starters. She discusses transistors in good detail. Rylan discusses Don Buchla and what it was like working for him. In the early 1990’s she was able to refurbish the Harvard University Buchla 100 system, at a time when she couldn’t afford one. One of my favorite anecdotes was her commentary on Bob Moog and his comments on Keith Emerson. Very good stuff! Check out some of the The Synthesizer Book videos on Youtube here). A sound artist and electronic musician who builds unique analog synthesizers, Rylan has performed across North America and throughout Europe, Russia, and Scandinavia; conducted workshops in Los Angeles, Chicago, Boston, Ghent, Belgium; and Kabelvåg, Norway; and created sound installations at MIT’s LIST Visual Arts Center, the Boston Center for the Arts, and elsewhere. Her recordings are available on labels including Important Records, Ecstatic Peace, and RRRecords.